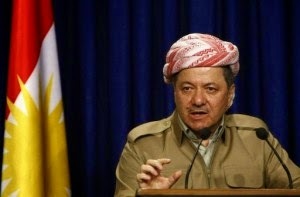 Kurdish President Massoud Barzani told Kurdish regional parliament in Erbil today that the Kurds have the international support for independence and called for a referendum to decide the future of Kurdistan. Barzani also said that the Kurds have no plans to relinquish control of Kirkuk and other disputed areas. “The Peshmerga forces will not pull out from Kirkuk and the disputed areas,” Barzani declared. The creation of an independent state has long been the dream of Kurds, who were first promised a referendum on statehood in 1920. Following the establishment of a no-fly zone in 1991, the KRG enjoyed de facto independence before joining the government in Baghdad after the fall of Saddam. Barzani’s chief of staff, Faud Hossein, told a gathering at the Washington Institute on Wednesday that Kurdish independence could take the form of a confederation of independent Kurdish and Iraqi states if Baghdad could re-establish its sovereignty over Sunni areas now under the control of the Islamic State. KRG’s foreign relations chief, speaking at the same event in Washington, said having a referendum on independence passed by the people in Kurdistan does not mean that the Kurdish government will implement it immediately. “We want to show our friends that we have done everything to help the political process in Iraq,” said Falah Mustafa Bakir, KRG’s head of foreign relations department. Only if it doesn’t work out, he said, will the Kurds opt for independence. However, Barzani in his address to the parliament today did not set any such conditions if the referendum is passed. He was calling for the independence of Kurdistan.